Throughout the duration of Battle Road many solidiers on both sides gave their lives for their cause. 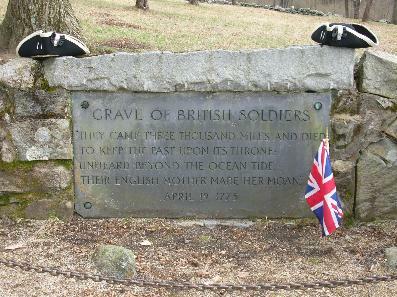 Many of the Colonial soldiers that died on Battle Road have been commemorated in some way. They have their names etched into history for all to see. The British soldiers on the other hand have been tossed to the side, forgotten, they're just brits anyway right? No! They gave their lives for their country and what they thought was right. But where in the text books does it say that 73 brave British solidiers gave their life? They also should have the right to remembered and honored. This is to them. Written, perpared and uploaded by Jacob Klickstein, Isaac Klickstein, and Susan Lester. "The die is now cast; the colonies must either submit or triumph.... we must not retreat."